I happen to be the only person in my family that likes sloppy joes. It's sad. Mostly I cook, to please the masses, but once in a while you gotta cook for yourself! Because I don't make sloppy joe's often I never have a store bought seasoning packet around when the mood hits. 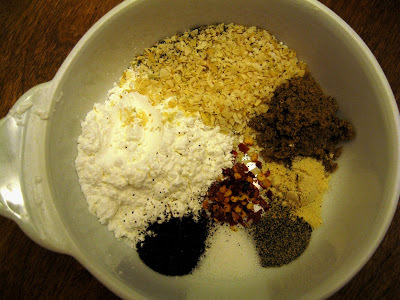 I make my own seasoning packet with spices I already have in the pantry. If you'd like to make multiple batches at once, I recommend placing a small bowl on the counter for each packet you'd like to make (say 5 packets, so put out 5 bowls). Then make the recipe below into each bowl, then just store in ziplock baggies in your pantry. Feel free to increase or decrease the chili seasoning and red pepper to taste. Mine is a mild seasoning level. Cook hamburger and drain grease. Then stir in remaining ingredients and simmer till heated through. Serve on buns.